Q: Is there a fine for littering in California? A: Yes. According to California law, it is a misdemeanor to throw anything from a moving vehicle. The law prohibits littering, as well as throwing lighted cigarettes from a motor vehicle. The penalty for littering is a $1,000 fine. For more FAQs on how litter damages our state and info on what you can do to prevent it, visit www.donttrashcalifornia.info. 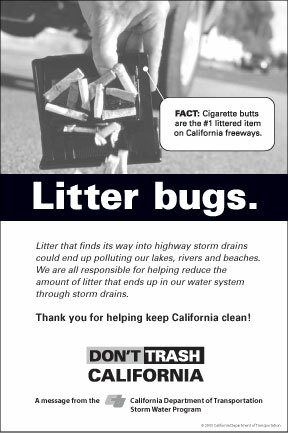 The Don't Trash California Storm Water Public Education Campaign is the Department of Transportation (Caltrans) Storm Water Management Program's 22-month, $6.5 million statewide effort to reduce the amount of pollutants (including litter) that enter the highway storm drains. The campaign is based on Caltrans' successful three-year, public education pilot program completed in the Fresno Metropolitan Area in 2003. Using a comprehensive, multicultural approach, the Don't Trash California campaign targets primary offenders of highway littering, as well as the general public, to create a social mindset in California that this State does not tolerate polluting our freeways and highways. The campaign implements proven strategies, including media advocacy, special events, partnerships, paid media and community outreach, to raise the level of awareness of the effects of littering and encourage the public to avoid littering. The campaign is being conducted in accordance with the National Pollution Discharge Elimination Systems (NPDES) Permit requirements. This is a Flickr badge showing public photos from Answer this.... Make your own badge here. has a passion for music, NASCAR, the internet & all things pop culture, as well as an insatiable appetite for news and random information. 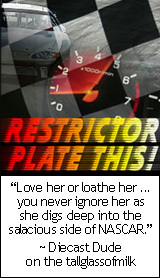 janet campbell tait on NASCAR: Can female drivers be competitive in this...? AIDS :: Cure or Conspiracy?